How Do I Customize The Fit? How Do I Put On Booties? Have your child stand on a flat surface on a piece of paper and mark the tip of the longest toe and the back of the heel; measure and add ½” for growing room. Refer to the sizing chart below to find the corresponding size. If the measurement is within ¼”, go up a size. Nooks Design booties will stretch and mould to the foot after a few hours of wear. Can Booties Be Worn As Winter Boots? 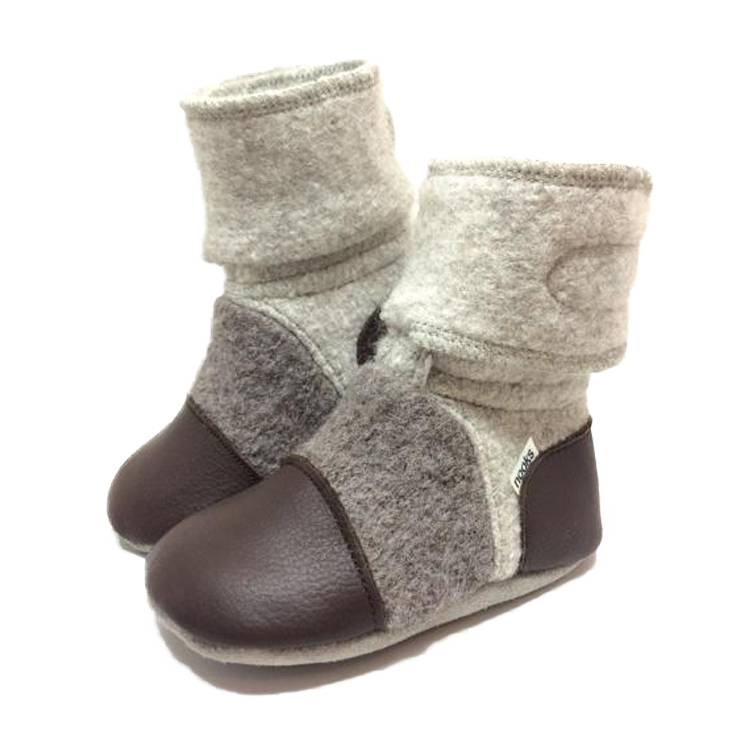 Our booties are made from felted New Zealand lambswool which translates to a breathable, warm and water-resistant product that will keep your little one dry even in cool and damp weather like what you experience on the East Coast. 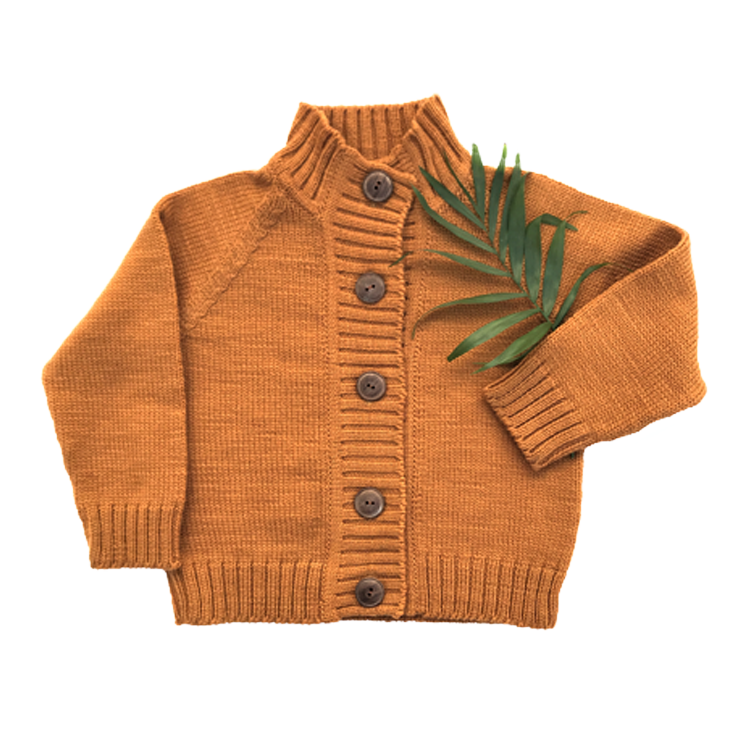 At 12 months of age, your little one will likely be wearing these will going for stroller rides and being carried which will work very well (they can even wear wool socks inside to provide a bit more warmth during really cold days). While the natural leather outer soles are lined with felted wool on the inside to provide cushioning and warmth from the cold ground, they are not intended to replace heavy winter boots which are fully wind and water-proof. If you are looking for a foul weather boot while maintain the benefits of soft soles, we recommend pairing up our booties with a nylon shell like Stonz or Sherpa. 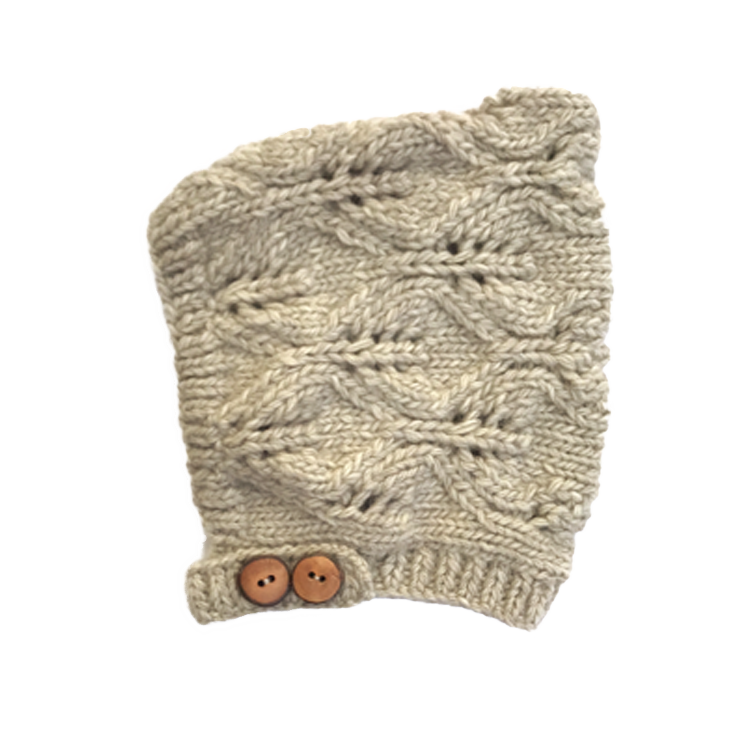 How Do I Wash My Merino Wool Cardigan or Knit Bonnet? To keep your hand-knit goods clean and looking good, hand wash with lukewarm water and mild detergent. Rinse well, gently press out any remaining water and lay flat to dry. If the garment is heavily soiled, machine wash separately with cold water on a gentle cycle and lay out to dry. Putting your wool products in a dryer will cause them to shrink dramatically and should therefore be avoided. Damage/shrinkage due to drying in a machine will void warranty. Can You Wash Nooks Booties? The best way to clean the booties is to use mild detergent and hand washing them. If they’re heavily soiled, you can safely machine wash them in cold water on a gentle cycle; it’s ideal to keep them separate from other articles of clothing. The most important step is to air dry them and avoid exposure to intense sources of heat like a dryer or a hot air vent. Please note that drying your booties using a dryer will void warranty. We pride ourselves on sourcing top quality leather and use 100% genuine cowhide leather for all our booties. While the finish is durable, heavy use and rubbing against abrasive surfaces will lead to scuffs and scratches. This is totally normal and not a sign of a manufacturing issue. Please also note that it’s possible that some dye from the leather transfers to lighter-coloured fabric and clothing when it’s wet. This is not a manufacturing defect or reason to worry, it’s simply what happens to the dye despite working with high-quality materials. Is Wool Going To Be Scratchy? The felting process involves applying warm water, soap and friction to the knit wool to have the wool fibres intertwine to create a material that has structural integrity and strength. The stray ends get tucked back into themselves which results in a soft and smooth surface that does not scratch or irritate the skin. If your child is very sensitive to wool fibers or suffers from eczema, it may be best to only wear our booties with socks. We use the same pattern for all booties of the same size. However, all Nooks Design booties are handmade and will therefore have slight variations that can be caused by varying material thicknesses and slight differences in the way they’re sewn. These differences will disappear soon after your little one begins to wear them and stretch them out. Good For Babies Learning To Walk? Yes! We created the first pair in response to a need for a stylish, comfortable and soft sole shoe that would be ideal for our baby to learn to walk in. There is a growing body of research in the international pediatrics community that supports having babies walk either barefoot or in soft sole shoes to encourage balance, posture and coordination. As children grow, they develop muscle strength through adapting to the changing contours of the ground they walk on. We pick and ship your online orders within 48 business hours and as soon as they’re sent out the door to the post office, a note is sent to you electronically providing a tracking number. Please check your spam/junk box if you haven’t received this message as your email system may have filtered it out. Please refer to our Exchange Policy found in the footer of our website for all the details. We’re always happy to coordinate an exchange for unworn product towards anything else that’s listed on our website. Please note that you are responsible for return shipping, any difference in price between the returned and new item(s), and shipping back to you. Do Your Booties Run "True To Size"? Believe it or not, there is no international standard for baby/kids’ shoe sizes so what fit will vary between brands. 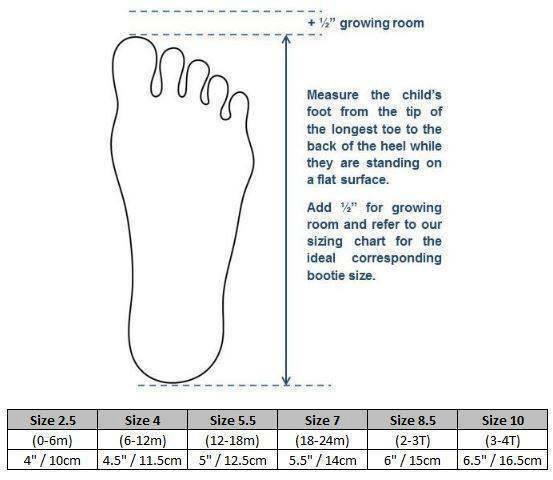 In order to ensure you get the correct size for your little one, please refer to our sizing chart. Chubby Feet, Thick Ankles, Wide Feet? One of the great things about using felted natural wool to make our booties is that they will stretch and relax to comfortably fit a very wide range of foot sizes and shapes. If you have manually stretched the wool and leather as we show in our instructional videos and there are still some tight spots, dampen the booties and have your little one wear them for an hour; the pressure and warmth of their foot will make them fit well.